For the Anglo-Sindh battle, see Battle of Dubba. For the seat in the New South Wales Legislative Assembly, see Electoral district of Dubbo. For the Local Government Area of Dubbo, see City of Dubbo. 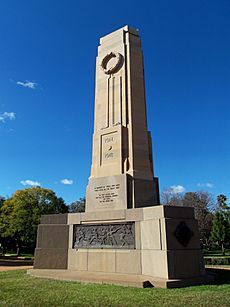 Dubbo /ˈdʌboʊ/ is a city in the Orana Region of New South Wales, Australia. It is the largest population centre in the Orana region, with an estimated population of 40,975 as of 2012, and serves an estimated catchment of 120,000. It is located at the intersection of the Mitchell, Newell and Golden highways. The nearest city, Orange, is approximately 144 km (89 mi) away. Dubbo is located approximately 275 m (902 ft) above sea level, 303 km (188 mi) north-west of Sydney (400 km (249 mi) by road) and is a major road and rail freight hub to other parts of New South Wales. It is linked by national highways north to Brisbane, south to Melbourne, east to Sydney and Newcastle, and west to Broken Hill and Adelaide. Evidence of habitation by Indigenous Australians dates back approximately 40,000 years. The explorer and surveyor John Oxley (1784–1828, born, Yorkshire, England) was the first European to report on the area now known as Dubbo in 1818. 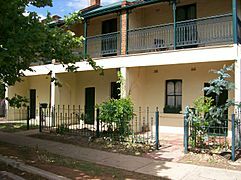 The first permanent European settler in the area was English born Robert Dulhunty, described as one of the wealthiest citizens in the Australian colony at the time. There are records of squatters being given permission to set up large sheep and cattle stations in the area in 1824 but these were not maintained. 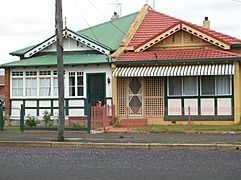 Dulhunty occupied a property, known as Dubbo station (established in 1828), from the early 1830s on a squatting basis. With the passing of the Squatting Act in 1836 he took out a licence on the property. Dulhunty showed an affinity with Indigenous Australians, his party included some 40 Aborigines and he favoured using Aboriginal names for properties, including Dubbo. Dubbo is now thought to be a mispronunciation of the local Wiradjuri word "Thubbo" but because of a lack of precise records from Dulhunty at the time and an incomplete knowledge of the Wiradjuri language today there is some conjecture over the word's meaning. A popular current theory is the word means "red earth", consistent with the local landscape. 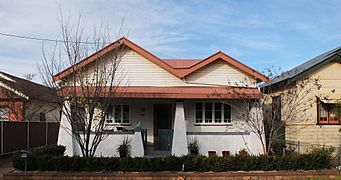 It is also possible that Thubbo or Tubbo is Wiradjuri for "head covering" – a theory put forward to support this name is that the shape of Dulhunty's house may have looked like a hat to the local people. Dundullimal Homestead is a farmhouse from that period, built around 1840 by John Maugham on his 26,000-acre (11,000 ha) sheep station. The building is one of the oldest homesteads still standing in western NSW and today is open to visitors. 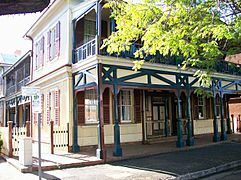 In 1846, due to the number of settlers in the area, the government decided to establish a courthouse, police station and lock-up in the Dubbo area. A constables residence was completed in 1847 and a wooden slab construction courthouse and lock-up in early 1848. By this time, the settlement had only four buildings; the constables residence, courthouse and lock-up, a store and an inn. Due to the lack of title for the land, in 1848 the storekeeper, Jean Emile Serisier, organised a petition asking for a land sale of town allotments. The plan was presented to the colony's Surveyor General in May 1849 by surveyor G. Boyle White. The settlement was gazetted as a village in November 1849 with the first land sales taking place in 1850. Population growth was slow until the Victorian gold rush of the 1860s brought an increase in north-south trade. In 1857 Schloeffel's populated dubbo. The first bank was opened in 1867. Steady population growth saw the town proclaimed a municipality in 1872, when its population was 850. The railway extension of the main western railway from Wellington to Dubbo was formally opened on 1 February 1881. By 1897, Dubbo had a general store, Carrier Arms, a slab courthouse, a gaol and a police hut. The final section of the Molong to Dubbo railway opened in late May 1925. Dubbo was officially proclaimed a city in 1966. Plains of the Dubbo region, towards the Warrumbungles. The Macquarie River runs through Dubbo, as does Troy Creek. 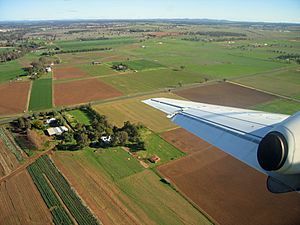 The City of Dubbo lies within a transition zone between the ranges and tablelands of the Great Dividing Range to the east and the Darling Basin plains to the west. Dubbo falls in the warm temperate climate zone. Under Köppen climate classification, Dubbo has a humid subtropical climate (Cfa) that borders the semi-arid climate (BSh). Summers are warm to hot, and winters cool to cold, that bring some occurrences of early morning frost but generally no snowfall–unlike the nearby city of Orange. The last occurrence of snow was recorded by The Dubbo Liberal and Macquarie Advocate in 1900. The town's location in this transition area also allows a large temperature variation during the year, with high summer temperatures, sometimes peaking above 40 °C (104 °F) typical of the Western Plains of New South Wales and colder sub-zero temperatures typical of the Central Tablelands in winter. Dubbo's location in the transition area between the Central Tablelands and the Central Western Plains have provided a mild distribution of rainfall throughout the year. Dubbo's wettest month is January with an average rainfall of 60.1 millimetres (2.37 in) occurring on average over five days. Evaporation in the Dubbo area averages approximately 1,880 millimetres (74 in) per year. Dubbo is considerably sunny, receiving 148.6 days of clear skies annually, in contrast to Sydney's 104 days. Wind patterns are ongoing over the whole year. The prevailing winds at Dubbo are from the southeast, south, southwest and west, which account for a combined 64.4% of the wind direction over the whole year. 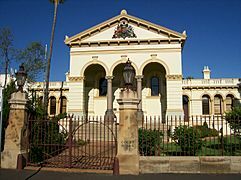 Dubbo has several fine examples of Victorian civic architecture including the (third) Courthouse (1887), the Lands Office with its use of timber and corrugated iron cladding, and the railway station (1881). Towards the centre of the city the older residential areas contain numerous examples of red brick houses built in the "California Bungalow" style architecture of the early 20th century, together with Victorian terraced houses (Mostly in the Darling Street area) and a few Edwardian semi-detached homes. Dubbo railway station lies on the Main Western railway line between Sydney and Bourke and opened in 1881. 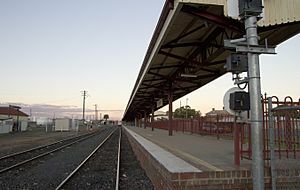 Dubbo station is the terminus for a daily NSW TrainLink XPT service from Sydney. 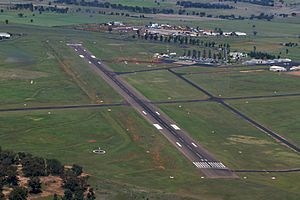 Dubbo also has its own recently upgraded airport, Dubbo Airport, with daily flights to Sydney (Qantas, Regional Express), Brisbane (JetGo), Melbourne - Essendon Airport - (JetGo), Newcastle (PelicanAir) and other small out-back New South Wales towns (Airlink). Buses also serve Dubbo, with major runs to Sydney, Melbourne and Brisbane. Sport plays a big role in Dubbo's community life. Rugby league is popular in Dubbo. Two teams compete in the Group 11 Rugby League – the Dubbo CYMS and Dubbo Macquarie Raiders. The city also has an Australian rules football team, the Dubbo Demons who were premiers in the Central West Australian Football League in 2007. There are also two rugby union teams, the Dubbo Kangaroos (Roos) and the Dubbo Rhinos, which compete in the Central West Rugby competition, the Blowes Clothing Cup. Dubbo Junior Cricket Association conducts cricket for over 500 children aged between 5 and 16 during the period October to March and also conducts 1st, 2nd and 3rd grade competitions during this time. Dubbo has a turf club, which incorporates a pony club, horse racing and organises shows and gymkhana. Ultimate Frisbee is a new sport to the town and is rapidly growing in popularity. The Dubbo Ultimate Frisbee Federation (DUFF) is the local Ultimate club and organises a local league and the Dubbo Meerkats Mixed rep side. The 'Dubbo Rams' compete in the men's and women's NSW State Basketball Leagues. Netball is also popular in Dubbo with competitions every weekend for all age groups during netball season at the Nita McGrath netball courts near the Macquarie River in Central Dubbo. Dubbo has a large Junior and Senior Hockey Association with representative teams for all ages while also participating in the 'Premier League Hockey' Competition in both the Men's (Dubbo Lions) and Women's (Dubbo Blue Jays). Soccer is very popular particularly among children. Dubbo has its own all-age men's and women's competition and has three teams – Dubbo FC Bulls, Westside Panthers and Orana Spurs – who compete in the Western Premier League. Dubbo also has one of the only 10 Lane pools outside of Sydney in NSW, the Dubbo Aquatic and Leisure Centre. The 'DALC' hosts meets through the Western Swimming Association (and affiliated clubs Dubbo City Swimtech and Orana Aquatic) and School Carnivals. Dubbo's Caltex Park hosted the annual City vs Country Origin match in 2006, with an attendance of 11,423, and in 2014, with an attendance of more than 9,600 in rainy conditions. 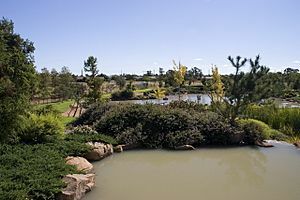 In 2007 Dubbo hosted the Junior World Orienteering Championships with most of the events held in the granite outcrops of the nearby Sappa Bulga Range. From this event the orienteering club Western Plains Orienteers was born. Other sports popular in Dubbo include lawn bowls, via the huge variety of bowling clubs, and golf (the golf is held on Dubbo's 27 hole golf course). Every September, the Multicultural Festival has a Parade & Festival in Victoria Park, & the following weekend a Dinner and Concert, held at the Dubbo Regional Theatre and Convention Centre. The festival is about celebrating the unity of cultural diversity within the region with over 70 nationalities represented in the community. Enjoy the performances by local and statewide performers of all cultures and partake of the multicultural cuisine on offer. The annual agricultural show, held around April/May of each year, is a major event for Dubbo and surrounding areas with a carnival like atmosphere. This event is the annual domestic steer and heifer (cattle) hoof and hook show. Each year over 100 beef carcase cattle are judged live (hoof) as led or un-led and dead (hook). It is also the annual young judges, auctioneers and paraders competition. These events are very popular among the schools and colleges of the New South Wales area. The Dubbo Eisteddfod is held annually at Dubbo Regional Theatre and Convention Centre, with students from Dubbo as well as surrounding regions including Gilgandra, Wellington, Orange, Gulgong, Narromine and Bathurst competing in the various sections.This involves Speech, Drama, Instrumental & Dance. The Eisteddfod runs from May until July each year. Dubbo International Body Building Championships is an annual natural bodybuilding event that has been held in the city for last 26 years. The INBA Dubbo Natural Physique Titles competition is sanctioned by INBA Australia, which is the Australian affiliate of the International Natural Bodybuilding Association. Dubbo Facts for Kids. Kiddle Encyclopedia.